Fighting for love and justice Sailor Moon is a 14 year old girl who saves a cat from a parking lot. This is not just any ordinary cat though. 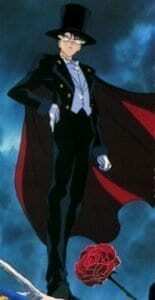 Soon after gaining the powers to transform. Later she finds others who have the same power as her, teaming up to form the sailor scouts! 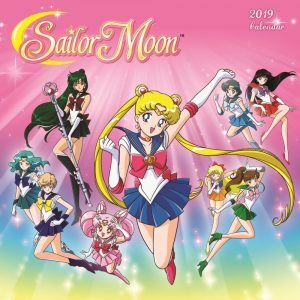 The anime series Sailor Moon first aired back in 1992 almost 30 years ago! 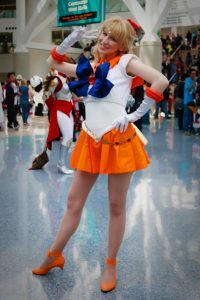 So it goes without saying that every anime expo has a sailor scout or 2. 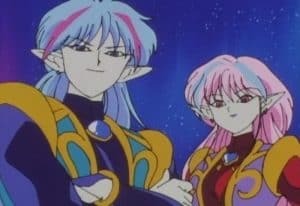 Even though Alan and Ann are only filler characters in Sailor Moon they still turn up often at anime cosplay events and anime expos. 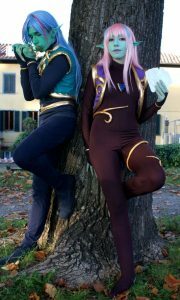 A good idea for couples who want to cosplay together from the same anime series. Alan has a flute that he uses as his weapon while Ann has playing cards. These are the best Alan and Ann cosplay costumes I could find online. 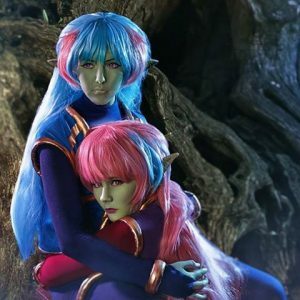 You can see in the first picture they have the cosplay wigs that are correct in color. The 2nd picture looks like the uniforms are a bit darker in color but from the anime it tends to be a purple and blue color. All 3 pictures and cosplays look good and match Alan and Ann from the anime series. If you look close you may notice in the 3rd picture that they have eye contacts in. You will want to make sure you match the eye color if you go with these 2 since they have an unusual eye color. 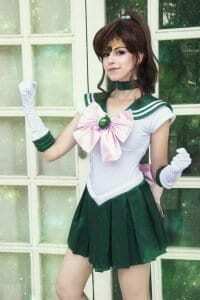 Sailor Jupiter is one of the original five sailor scouts and you can see her main colors that she wears is green and pink. In the anime we get to see her use some of her powers which are electricity and plant based. She enjoys playing sports and martial arts. Other classes she takes are cooking, ballet, and ice skating. Out of all the classes that she takes the one she does the best in is actually home economics. 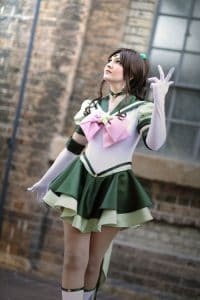 These cosplay costumes of Sailor Jupiter are amazing, there are so many good Sailor Jupiter cosplays to choose from that I had a hard time! Here you can see they have colors of green and pink and the last picture has the photoshop effects added to it. 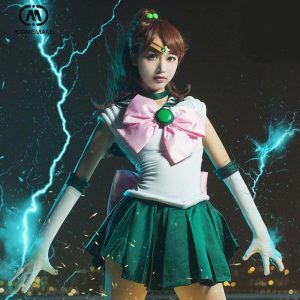 With lighting coming from her hands it looks awesome and makes the cosplay so much better! Her father sends her large amounts of money to attend the expensive school where she meets other sailor scouts. Sailor Mars main attack in the anime is Fire Soul, a gout of flame shot from her index fingers. 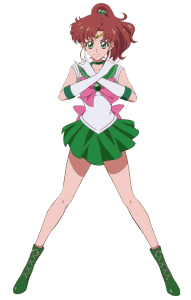 Her sailor outfit is a nice bright color red with bow and black hair down to the waist! 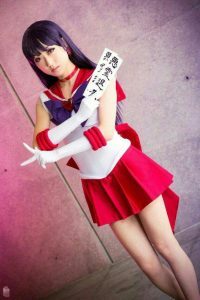 Sailor Mars Cosplay from a few different anime expos and events. You can see she has the long blackish hair always with the ritual cards in hand. All 3 of these cosplays look great having the red and white uniform along with the purple bow. 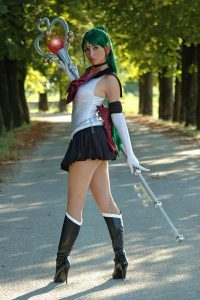 With this cosplay you will need a killer pair of red high heels and for some a bit of practice walking in them! 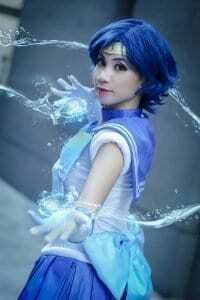 Sailor Mercury has some really cool colors. I think out of all the scouts she has the colors I like the most. 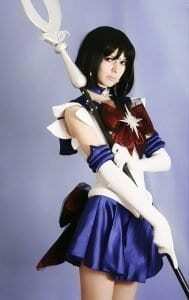 Like any other sailor scout she has some interesting abilities of her own! Mercury fires a stream of bubbles from her hands which pop, producing a thick fog. This thick fog is able to kill or stun small animals due to the fact that the temperature is cold! In school she tends to be very smart and intelligent. 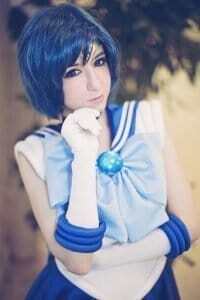 Mercury is one of the original sailor scouts and she has short blue hair. You can see with some photoshop effects how amazing this cosplay costume can turn out for your instagram account! A lot of people comment on the boots there pretty awesome and have a ice blue color accent on the top of them. 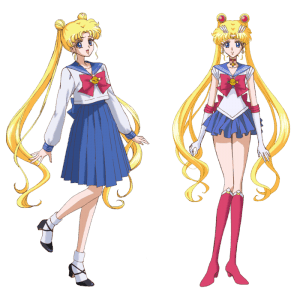 Sailor Moon is the main hero of the anime series Sailor Moon she is a young high school girl. Up until now she was a normal high school student then one day she meets Luna a talking cat in a parking lot. This changes everything as she soon starts off on her quest to protect everything good and stop evil in the world! You can see from the picture above the school uniform and the transformed version of her. 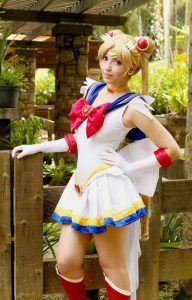 Being the main character of the anime series she is quite popular when it comes to people cosplaying as Sailor Moon. She has long blonde hair that turns heads at anime conventions along with a short skirt and knee high boots that are high heels. I think the hardest part of the costume is the 2 red gems in her hair. 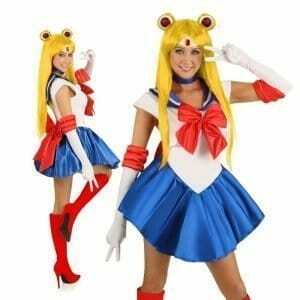 If ordering the sailor moon cosplay wig it should come with everything in place and you just need to wear it. 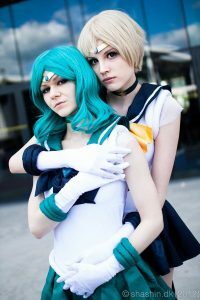 Seen working together with Sailor Uranus and showing up to battle together. 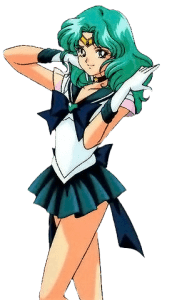 In the anime we get to see Sailor Neptune with her elements of ocean/sea and water. In the anime we get to know her and see that she enjoys playing the violin and later in battles some of her attacks have violin in it! She is also a very gifted painter and enjoying creating works of art! Just like in the anime Sailor Neptune is always with Uranus during battle and usually always fight together to defeat evil. 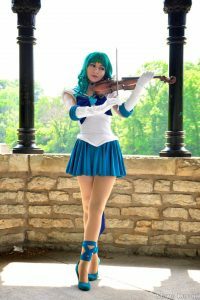 For this cosplay you want to make sure that you have a violin that looks real. They can be expensive to use a real one so maybe a broken one from the buy and sell ads will work just fine! 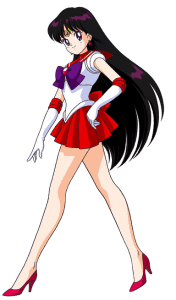 Like Sailor Mars and Uranus she wears some high heel shoes! The hair color is teal and same with the skirt and wrist collars. 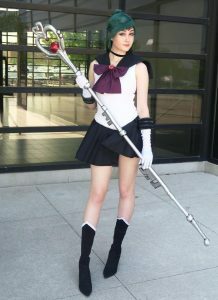 Sailor Pluto has one of the coolest weapons Garnet Rod, a gigantic key which is topped by the Garnet Orb and a heart. You can see some of the cool gems in the the staff. 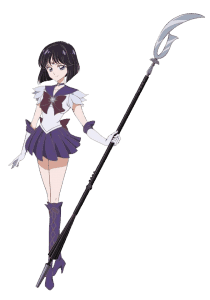 With the staff she uses her main attack the Pluto Dead Scream to fight evil. 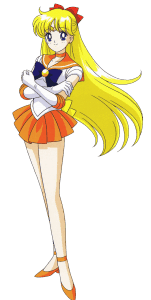 She is also a bit older than the rest of the sailor scouts. She is a gatekeeper and that is why her staff is a over sized key. 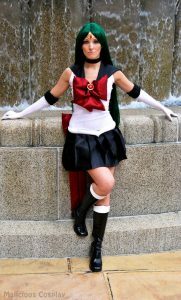 The black skirt and knee high boots that Sailor Pluto wears gives off a darker look. The red bow is almost like Sailor Mars but it is a bit darker in color. You can see she also has large earrings in her ear. 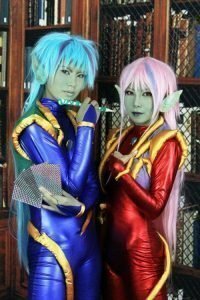 If you like having long hair and wearing a cool wig then you might consider this cosplay. She also has such a large staff its a eye grabber! 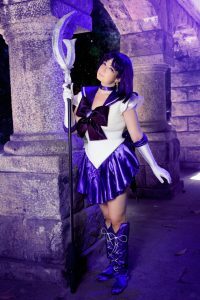 All of Sailor Saturn’s attacks are based on destruction and rebirth, she is so powerful that she can destroy a whole planet or solar system. 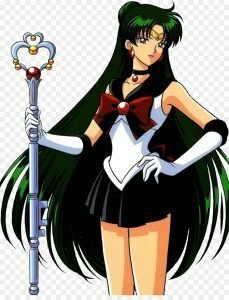 I guess that is why she has such a large sword and the most hostile of weapons compared to some of the other sailor scouts. She also has some white pearl earrings which are quite pretty and unique. 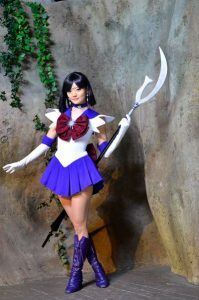 For this cosplay costume you need a short hair wig like seen above or the willingness to cut your own hair that short and dye it. Her colors are a purple blue which a large staff with blade on end. It’s a pretty intimidating character if she was coming right for you! Being one of the tougher sailor scouts and owning her very own helicopter! 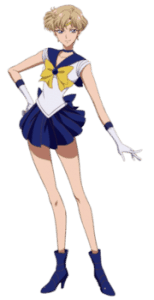 Sailor Uranus is very goal focused she also loves to race and it is said she is one of the fastest of the sailor scouts. When she does use a weapon sometimes it is a large dagger. 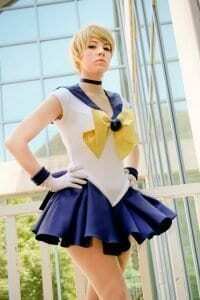 Sailor Uranus has a very different look to her she is known to be very tough and not afraid to speak her mind. She can be intimidating to deal with but that is what makes her so attractive! 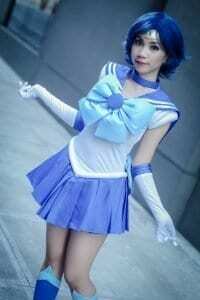 With great speeds and short hair like sailor Mercury a lot of people enjoy cosplaying as her. The blonde hair is also a nice look and ties in with the yellow bow that she has. Venus likes to perform on stage and one day hopes to be a famous singer! When she transforms into a sailor scout she gains the power of Crescent Beam which is a laser fired from the tip of her finger. In the anime she is able to use this and shoot it with great accuracy hitting her targets! She reveals that she is a sailor scout when rescuing Tuxedo Kamen from a trap set by Kunzite and Zoicite. 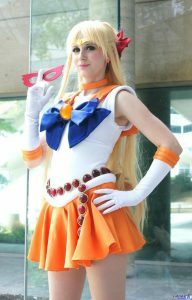 I really like this Sailor Venus cosplay costume its a bright orange with blue bow. The belt is a bunch of gems linked together which really adds to the costume. A red bow is worn on the back of the head. She also fights and wears high heel shoes that are orange with a strap around the ankle. 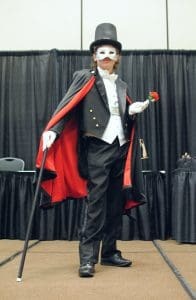 One of the only male characters in the show Tuxedo Mask is a good guy who helps Sailor Moon. 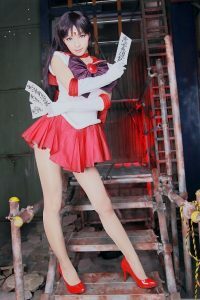 When he appears Sailor Moon is always love struck with him and you can tell when he appears since he throws a red rose. Upon landing it is usually quite dramatic. 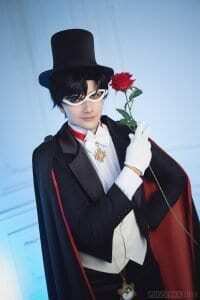 This cosplay comes with a cool cape and top hat! 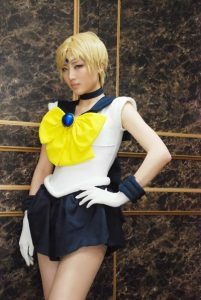 He is the most popular male cosplay character from the series, so popular that even women enjoy dressing up as him. 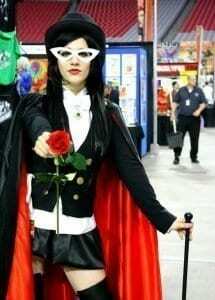 As you can see he always has his trademark red rose and cane in hand this is what he uses in battle. Out of all the costumes this is the easiest to make at home by going to local thrift stores as well as maybe a local craft shop.